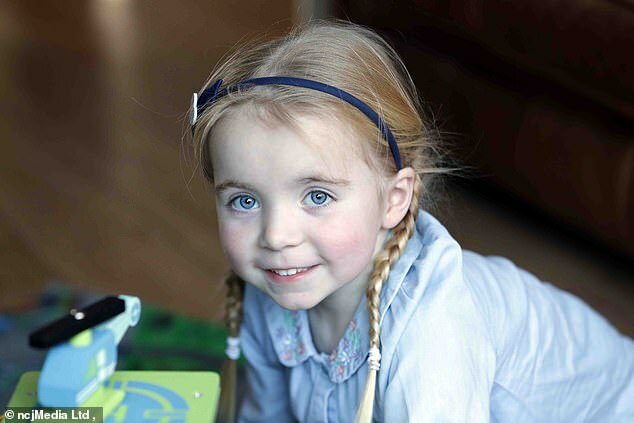 The family of a girl battling cystic fibrosis (CF) face the difficult decision of whether to uproot and move to Scotland in the hope they will have access to a ‘wonder drug’ that could prolong her life. Harriet Corr, from Jarrow in Tyne and Wear, was diagnosed with the genetic disorder at just five days old. 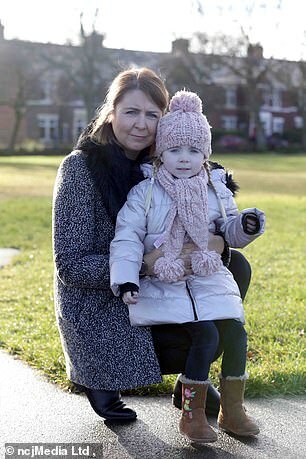 Her mother Emma Corr, 38, is forced to give her four-year-old daughter cocktail of drugs and vitamins, as well as intense physiotherapy, every day. But Harriet can’t get access to the medication Orkambi on the NHS in England. It slows a sufferer’s lung function decline – the main cause of death for those with CF – and has been approved for use in two-to-five year olds across Europe. 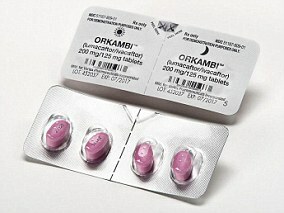 A deal for the use of Orkambi in Scotland is expected to be finalised soon to allow doctors to prescribe it, however, the drug is not currently offered by NHS England. Emma and her husband Chris, 36, must now weigh up whether to take the gamble and move north of the border with Harriet and their other daughter Nancy. Although settled in England, the family are begrudgingly considering moving to help give Harriet the best chance in life. ‘If the drug was made available here, there would be potentially 10,000 people who would stand to benefit,’ Mrs Corr said. ‘They are all being completely ignored. ‘The hope is Orkambi will check the underlying causes rather than just the symptoms. ‘I want Harriet to be able to go to university and get a job. We want her to have a long, healthy life where she can do everything she wants to do. Harriet is forced to take up to 16 tablets a day to ensure she can absorb nutrients from her food. Malnutrition is common among CF sufferers. She also has to endure daily physiotherapy sessions in an attempt to clear the sticky mucus that builds up in her lungs and digestive system. The youngster also has regular check-ups at the Royal Victoria Infirmary in Newcastle. ‘Harriet is getting to the age where she is asking why she has to do this,’ Mrs Corr said. Despite all the youngster has to endure, Mrs Corr insists her daughter is like any other four-year-old. ‘She’s the funniest, brightest and bravest little girl,’ Mrs Corr said. ‘She does not know any different – this has been her routine for as long as she can remember. Harriet’s parents have been at the heart of the campaign to make Orkambi available on the NHS for more than three years. The couple have joined protests and were at the House of Commons while the issue was debated by MPs. But the drug still remains unavailable in England after its use was rejected by the National Institute for Health and Care Excellence (NICE) and is only ever prescribed on rare compassionate grounds. The decision was based on cost factors and the lack of long-term data on Orkambi’s effectiveness. Vertex International – the pharma giant behind the drug – recently announced it was confident the drug has the ‘potential to extend life’ and will soon be available in Scotland. Mrs Corr has fiercely criticised NICE’s decision to reject Orkambi. ‘We are upset to live one of the most developed countries in the world and while most countries have access to this drug, why on earth can’t we?,’ she said. ‘Everyone in the CF community is so happy for Scotland, but it’s just difficult and frustrating for us. ‘We seem to be at an impasse in England. It’s all down to costs which is barbaric. All I can do is try and shout as loud as I can about it, what else can I do? A spokesperson for NHS England added: ‘We understand how difficult it must be [for] families affected by cystic fibrosis. Orkambi is a medication licensed for use by people in the UK with cystic fibrosis, but it is not offered on the NHS except in extreme circumstances. The drug targets the F508del gene mutation, which affects about 50 per cent of all people with cystic fibrosis. It is made of a combination of drugs – lumacaftor and ivacaftor – which work together to keep a healthy balance of salt and water in the lungs. There may be more than 3,000 people with life-limiting cystic fibrosis in the UK who could benefit from the drug. But the National Institute for Health and Care Excellence (Nice) said in 2016 may not be cost-effective enough, at £104,000 per patient per year, to be offered on the NHS. More than 117,000 people have signed a petition calling on the Government to make Orkambi available on the NHS, and Parliament discussed the petition in March this year. Nice is expected to review its stance on the drug in July 2019. Daniel Bodio, an engineer from Swindon in his mid-30s, was prescribed the drug on compassionate grounds. He said it improved his lung function from 25 per cent – when he was facing having to have a transplant – to 39 per cent within three weeks.